to how to view or transfer them to DVD (they are unreadable in QuickTime). doesn't even do any transcoding so can burn 6 hours of shows in about 40 min. ReplayTV DVD it was a nightmare and the soundtrack was out of sync. to know in case you want to post an update or are still using your Replay. Popcorn 4 is also great for capturing streaming web videos. This help file is written for Mac OS10.3 and a 5xxx series ReplayTV. 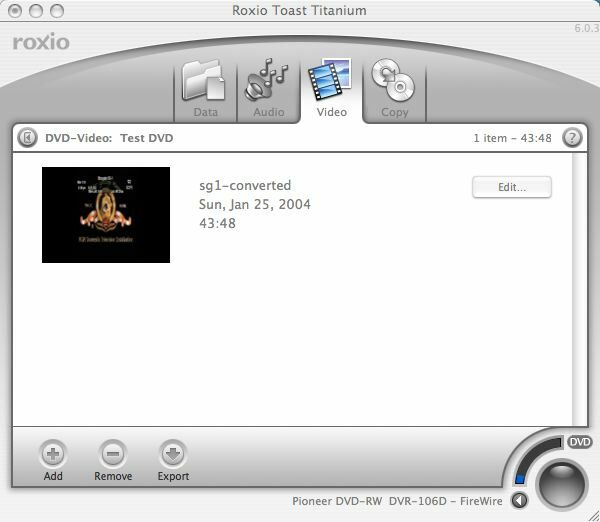 This is not the only way to create DVDs from ReplayTV files, but it is one way. And since I have been unable to find a step-by-step guide to this conversion process, I have created one. The command line toolkit is also available for Win32 and Linux. DVArchive is a Java based application used to download video from a ReplayTV and to stream video back to one. Use this software for moving files from your ReplayTV to your Mac. Thanks to the authors at sourceforge.net. 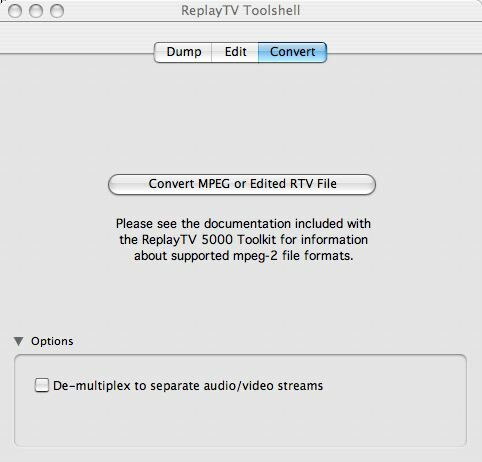 Needed to play back ReplayTV MPEG-2 files on your Mac. 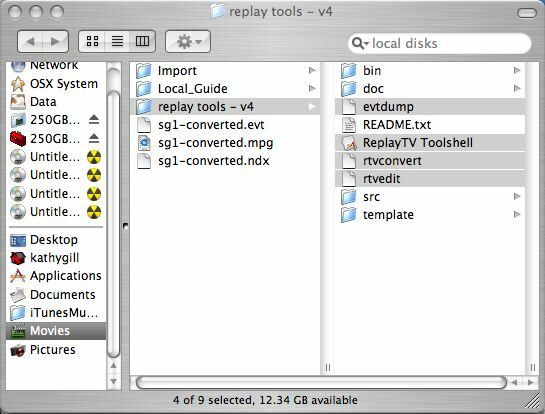 ReplayTV tools are a collection of command line utilities used to work with MPEG-2 streams from ReplayTV 5000/5500 series. The tools can be downloaded from the AVS Forum or from Planet Replay. Many thanks to Lee Thompson. Check the boards for the latest version. Provides a GUI for the above command line utilities. Thanks to Solutions Etc. Available from Amazon or through academic sources if you are a student or faculty. Used to author the DVD. This help file assumes that you have already installed DVArchive and have succeeded in transferring a Replay file to your Mac. I found it easiest to place the ReplayTV Tools in the Movie directory. I moved the OSX binaries and the Toolshell to the root level of my (renamed) tools directory. The first thing you should do is to correct the permissions on the binaries. 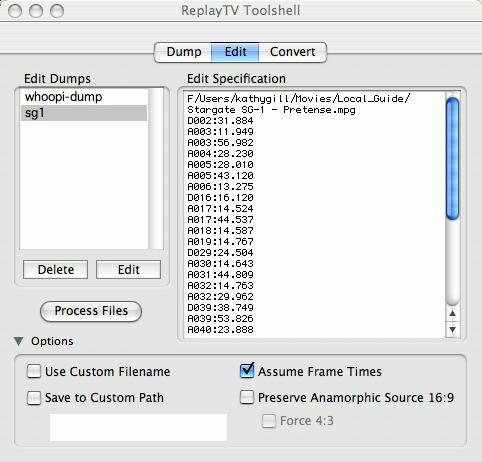 Launch the Replay TV Toolshell. Set the local Replay TV folder (mine has not encoded the full path) and the Tool Kit binaries folder. EVTDUMP creates an edit script that marks perceived commercial breaks. The output is editable; see the documentation that comes with the tools. Select the dump tab. Select the .evt file of the Replay show that you wish to edit. Select dump selected file. RTVEDIT edits one or more source MPEG-2 files to produce a new MPEG-2 file. Even if you do not wish to remove commercials, you must run this step. Select the edit tab. Select the correct dump file from the left column. Select process files. . Wait - the time needed to process will depend upon your processor speed and if this is the sole activity being performed by your CPU. My old Pismo (400) powerbook processes a 1-hour show in less than two minutes. The new, edited file has the same name as the original Replay file, with the number 1 appended. Before converting the file to a DVD friendly format, check to see if you like the edits. Edit the dump file if the times are not correct. For more detail on editing, see the documentation that comes with the tools. RTVCONVERT converts any qualifying MPEG-2 file for use with DVD authoring software. NOTE: Do not perform RTVCONVERT on a raw ReplayTV file. It must be processed with RTVEDIT (even if no edits are made). Select the convert tab. Decide if you want separate audio-video streams or one stream. Select the edited file for conversion. Wait - the time needed to process will depend upon your processor speed and if this is the sole activity being performed by your CPU. My old Pismo (400) powerbook processes a 1-hour show (standard format, commercials deleted) in less than four minutes. Sit back and enjoy ... at least that's the goal ... but my old Sony DVD/CD/VCD recorder doesn't "hear" -R or RW media (ie, plays video only). I had initially thought the problem was with the burn -- but I tested on a new G4 PB (mine has sound problems at the moment) and voila! It worked marvelously. So now I get to buy a new DVD player. Created a disk image (thanks to whomever suggested this test method on one of the boards) using separate video and audio files. Tried to create disk image from single converted mpg file (combined video and audio). Sizzle failed: "An error occured while (re-)multiplexing. Make sure all program streams have DVD NAV sectors." Used Neo to create disc image on the Dell and am playing it as I type. It has sound. Aside #1: am wondering if Windows hardware/software manufacturers will finally correct CRT gamma -- the movie is exceedingly dark on the PC, compared to the TV or the Pismo. Aside #2: the older (and slower) Pismo handles full screen output much more smoothly. Odd. Aside #3: Neo's "authoring" of the disc image was exceedingly slow -- definitely an "overnight" process and not something to implement for converting the volume of SG-1 and Farscape episdoes we have amassed.